Last November, Hope Mohr’s Bridge Project presented Reorganizing Ourselves, a three-part performative lecture featuring choreographer Deborah Hay and philosopher and cognitive scientist Alva Noë. Hay discussed the importance of questioning in her dance-making process. Noë elaborated on the relationship between art and philosophy and the role that imagination and negative space play in both. The last part of the lecture was facilitated by dance curator Michèle Steinwald who encouraged audience members to each raise a question. Questions poured from the audience while Steinwald and Noë dutifully wrote them down. Remaining unanswered and unused as a starting point or trigger for a dialogue, the questions formed a peculiar collection that became a performance in itself. The viewers thus relinquished their traditional audience passivity to become active participants and co-authors of the lecture. They were thus not only reproducing the mode of working that Hay has championed (using questioning as a mode of creative reorganization) but also practicing a common activity shared by philosophers and artists: delving into questions and more often than not, leaving them unanswered, navigating the space of possibilities and uncertainties that a question offers. The same month that Reorganizing Ourselves was taking place, American choreographer Trajal Harrell was in the Bay Area for a week-long residency hosted by Cal Performances. His show, The Ghost of Montpellier Meets the Samurai will be presented on March 18 and 19 at Zellerbach Playhouse. 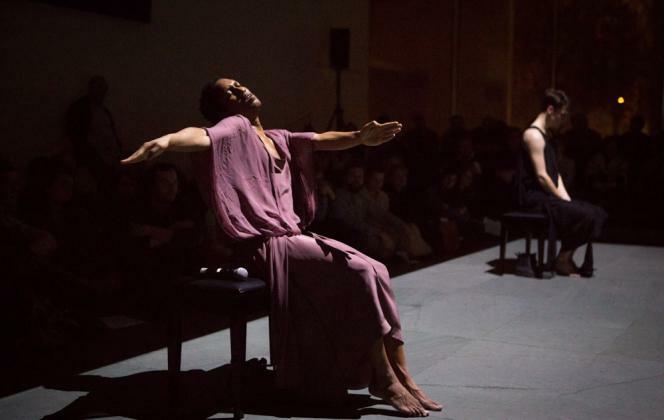 Harrell’s most recent piece –Twenty Looks or Paris is Burning at the Judson Church – explored the following: What would have happened if the voguing ball scene in Harlem, as portrayed in the documentary Paris Is Burning, had come to the Judson Church and performed next to the postmodern dancers in the early sixties? In both Twenty Looks and The Ghost, Harrell revisits significant moments in dance history and creates alternative historical possibilities in the present context. In The Ghost, he organizes an imaginary meeting between Tatsumi Hijikata, the founder of Butoh dance; Dominique Bagouet, the leader of the Nouvelle Danse in France and Ellen Stewart, the founder of La MaMa in New York city. While Harrell was in town, Cal Performances Associate Director Rob Bailis facilitated a conversation between the visiting artist and four Bay Area dance makers: Monique Jenkinson, Nicole Klaymon, Shinichi and Dana Iova-Koga. The conversation was meant to be informal, an opportunity to share perspectives and create a dialogue. Although all the artists present in the conversation have very different styles and aesthetics, similarities surfaced in the way they each address history and artistic training. The Yova-Kogas revisit, expose and question their early training in Butoh and combine it with new aesthetics in their work. Similarly Klaymoon places street dances such as popping, locking, or hip hop within the context of concert dance by way of improvisation or Documentary Theater. With her drag persona, Fauxnique, Jenkinson has put drag in conversation with other dance forms such as contact improvisation or ballet. The five artists discussed their lineage and process before sharing excerpts of works they have created. Rather then attempting to summarize the 4-hour exchange, I have chosen to reproduce the spirit of the third act of Reorganizing Ourselves and share the questions that were raised by the artists during their conversation. What does it mean to hold opposing philosophies in one’s body? How can the clichés and tropes of one genre inform another? Is it possible to honor the tradition where one comes from without being limited by it? How much does terminology and label trap one’s work? By creating an instability in one’s practice, does one make it impossible to adequately convey what one is doing? What role does resistance play in art making? Can the impact of one’s training be considered as a vantage point, rather than a prison? How do you deal with orientalism? What is my fascination with orientalism? Can I locate where I am, what I bring to it and not disown it? Can we revisit performance as a way of archiving? How is our training inscribing our dancing body? How does this piece of clothing necessitate that I dance? What is my native [movement] language? Where does my body go to when I improvise?